I walk past this building every day. I have never been inside but am often gazing longingly through the window. The mixed business convenience store has nothing inside I want. I only peer through the window dreaming for what I wish it could be. If the building went to sale tomorrow and at the same time I won the lottery – I would buy it. I’d quit my job and put everything I had into making this place a hub of massive plastic free and zero waste proportions. It would be a sustainability mecca for the western Melbourne suburbs. Like No Plastic Fruit and Vegetables I would work actively to create a store void of plastic. There would be no plastic bags. No plastic receipts. No plastic anything. I would aim to make it as natural as I possibly could. The walls would be lined with wooden containers housing the staples sans any packaging. Flour (gluten and gluten free), rice, salt, sugar, quinoa, nuts, cereals, dried pastas, beans – the whole gambit would be housed there. And on the identification labels, next to the weight would be a detailed description of how the item is transported to the store, in what material and if the packaging is returned to the supplier for reuse or how it is recycled by my store. There would be barrels of olive oil, sesame oil, soy sauce, tamari, almond oil, vinegar, tahini, nut butters and honey. If there is something missing, then the shopper can let me know and I will see if I can stock it. Hard to source items would be available like tofu, olives, nori, soba noodles. Milk, yogurt, cream would come to us in glass jars that would have a 10c refund scheme. I wold sell butter unwrapped – just bring your container and tell us how much you would like. Cheese would come in wax without a sticky label. And I would have a small range of broths frozen for people to take home in winter. A collection of fresh seasonal vegetables and fruit from local farmers would be available without those annoying plastic stickers. There would be a counter with freshly made condiments and spreads like mustard, tomato sauce, jams and maybe even a Vegemite equivalent that people could buy with their own jars. Oh and there would be a aisle of tea and coffee too. On one wall there would be taps ready to pour alcohol. Patrons would visit with their growlers and empty wine bottles to fill with beer, wine, vodka, whiskey and any other locally made alcohol. The empty barrels would be collected and swapped by the delivery team for new flavors and blends – but never new bottles. Then there would be the cleaning products. Safe and simple ready to go into reusable containers to take home. I would sell a collection of natural and locally made cleaning items too not made of synthetic fibers. Bulk buying options for beauty products would be available. Rosehip oil, jojoba oil, select essential oils, cocoa butter, beeswax, massage oils, activated charcoal, clay and also suitable containers to put your homemade beauty into. Because sometimes it can be hard to find those. Customers could pick up a bamboo toothbrush too. The store would own a truck, fitted out with bulk containers. 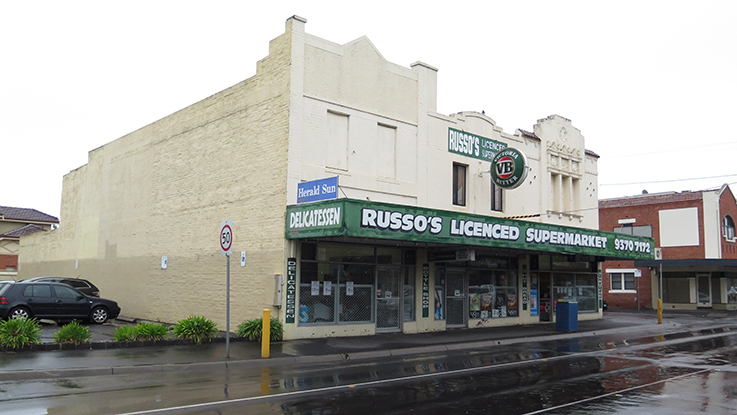 Once a fortnight I would visit rural communities on the outskirts of Melbourne’s western suburbs allowing keen locals to buy items from the truck in their own containers like olive oil or vinegar or floor cleaner. The community would be so inspired they would start their own bulk co-op store. Because this is Australia and our mornings revolve around brunch there would be a cafe within. It would be modelled off a venue in Berlin where I had a treasured dining experience, enjoyed not just because it was my brother’s birthday (that is a big contributing factor of it being a fond memory) but for the simplicity. Patrons would enjoy hearty vegetarian and vegan meals with no plates over $10. A set amount of food would be made each day and if the meals ran out before the store closed then that's just the way it is. I would not over cater. There would be no food waste, everything would be composted and I would not offer take away unless the patron had their own to-go containers – this includes coffee. Nope, not even bio takeaway coffee cups would be available in this cafe. You either have to bring your own or sit down to enjoy your coffee. There would also be no straws available either. Also, I would offer to take customers vegetable scraps for compost. It’s only neighborly. It is close to the train station, has ample parking and is a stone’s throw away from a busy main street. I would have space for classes on plastic free & zero waste living and host local community groups. Right now it’s just a dream. 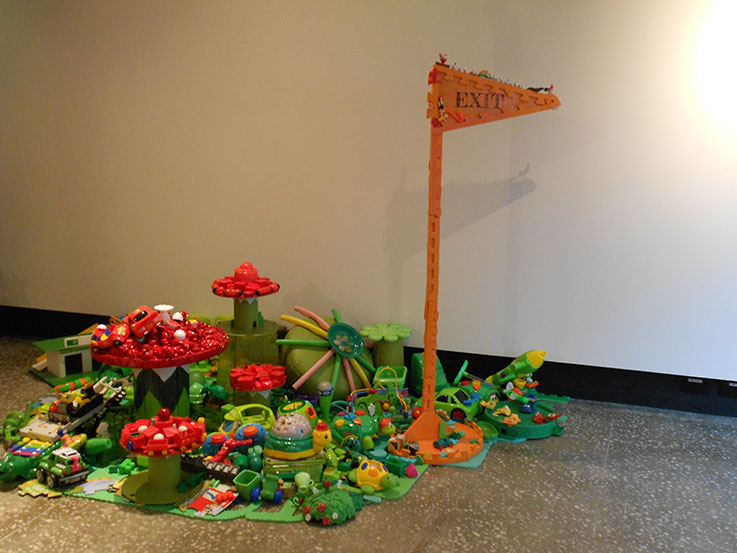 Over the weekend I visited The Ersatz Fantasia Project exhibition at the Yarra Ranges Regional Museum, a fantasy forest of recycled toys, games and plastic products that would otherwise end up in landfill, reflects on the environmental impacts of our consumer choices. The main room is created to look like a magical forest. In the center is a tree covered with discarded plastics toys. Surrounding the tree lays garden with a path guiding viewers along, passing a bench made of teddy bears and by a fairy garden. 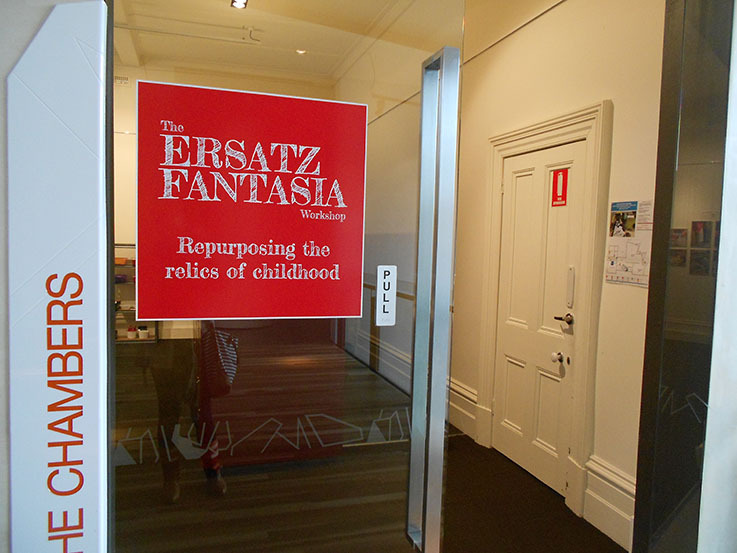 The Ersatz Fantasia Project evolved when I realised how many material items my family of six have accumulated. I was particularly shocked at the number of toys my children had, and how quickly they outgrew or became disinterested in them. Not only that, but the majority of the plastic toys were either broken or had parts missing. This work extends beyond me as the artist. Community members, friends and family have contributed to the making of the work or donated materials. 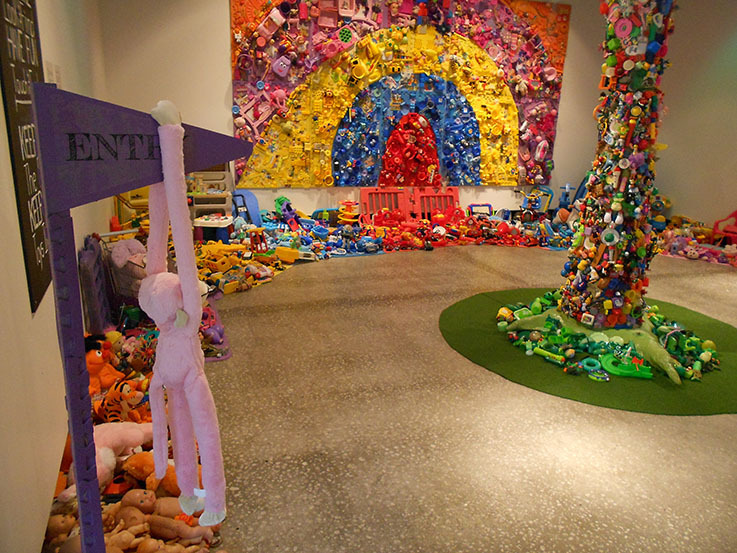 Many toys in this exhibition were also collected from charities which, not being able to offer them for sale, would have otherwise been forced to pay for their disposal. For someone who tries their hardest to avoid plastic walking into the room was overwhelming. I saw every object on its own. 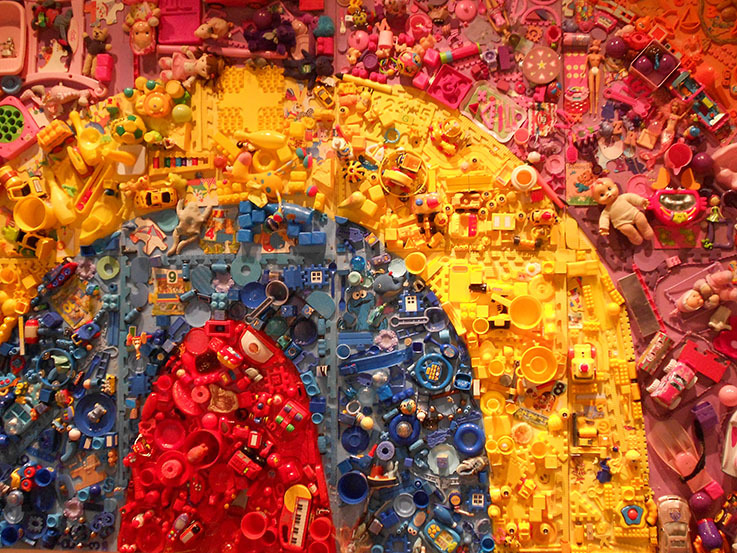 Had this exhibition existed before I went plastic free life I wonder if I would have seen each piece or would it have been just a colourful installation making a comment about plastic pollution. I also wondered what had happened to all my old toys. 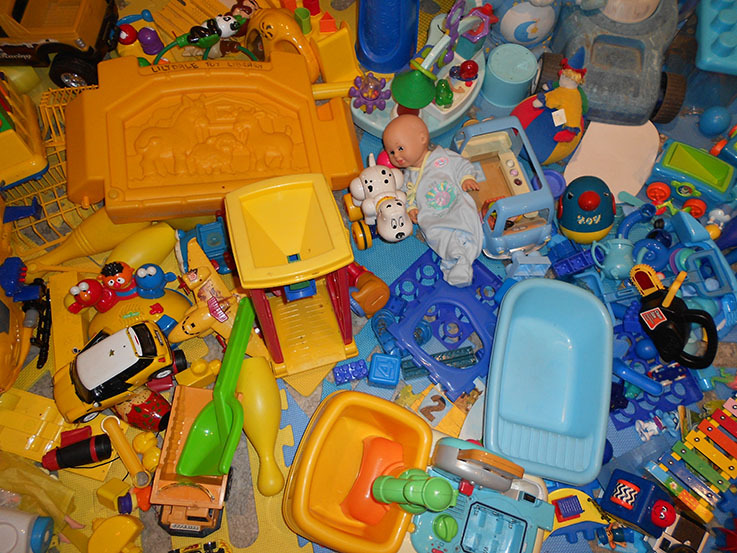 Is my childhood just sitting in landfill? And what will happen if I were to become a parent? Fantasia Rules: Explore, look and find. Have fun, touch and feel. Keep to the path, keep the toys in place. Up the stairs there was a room dedicated to workshops with different interactive stations for groups to understand the deeper meaning of the exhibition. Downstairs one could easily loose themselves in their childhood but in the workshop I was firmly reminded that this exhibition is about the future. 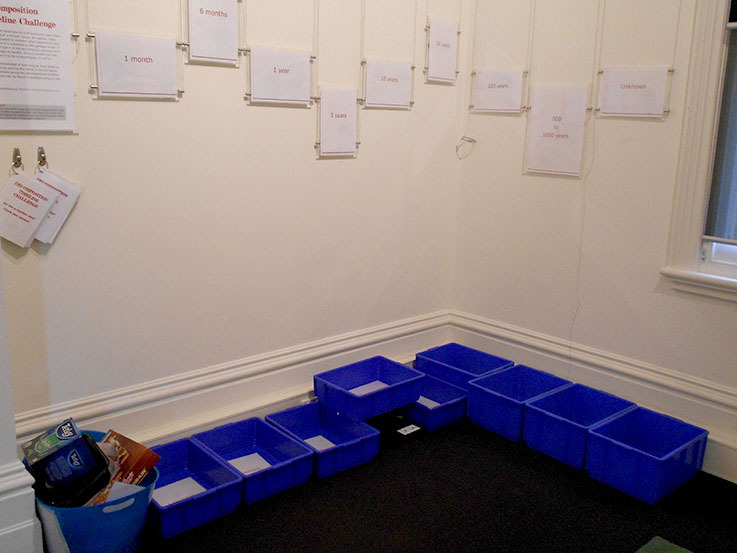 In one corner visitors are asked to take a rubbish bin and sort the items into how long they believe each item would take to break down. 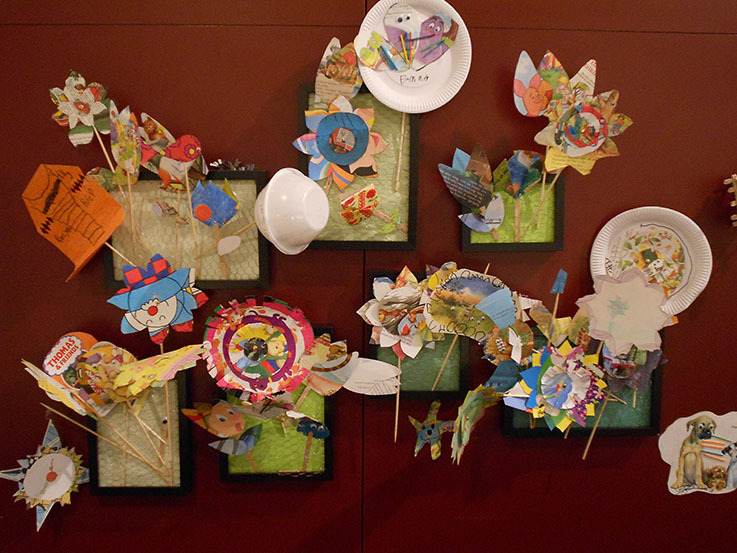 Children are encouraged to create sunflowers and tulips by up-cycling scraps of paper from books and magazines. There is a place to sit down and watch the migration of a plastic bag from a grocery store parking lot to the Great Pacific Garbage Patch in the Pacific Ocean in the mockumentary The Majestic Plastic Bag. 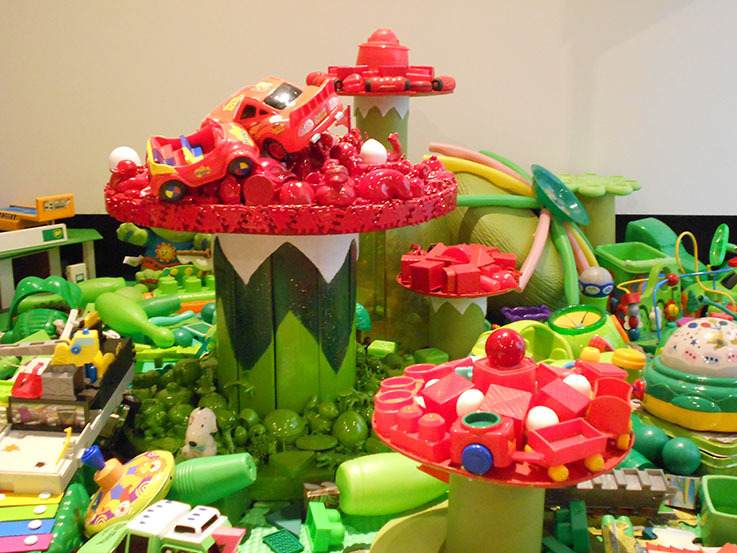 It's an imitation forest or garden made of artificial, plastic toys. It is made completely of man made products, the manufacture and disposal of which causes harm to the natural environment that it is imitating. 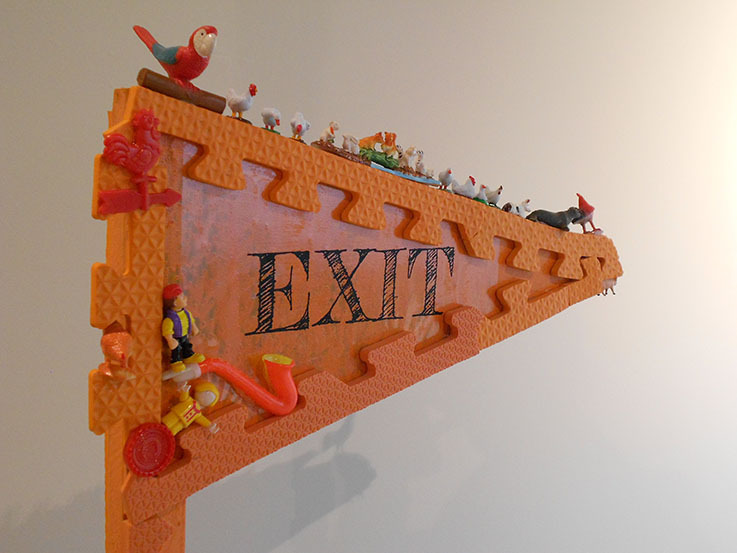 This coming Saturday visitors can join artist Rachael Hallinan to repurpose toys and create household items. Create colourful and eye catching objects for your home. No crafty experience necessary, just have fun learning how old toys you might usually throw out can become something new and delightful! The Ersatz Fantasia Project is wonderful hands on approach to get conversations started about plastic and our consumer behavior. Thank you to the Yarra Ranges Regional Museum for inviting me along. 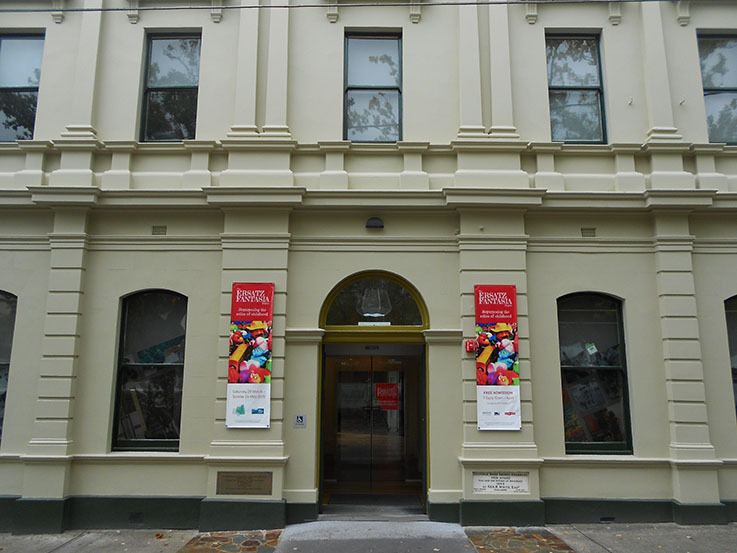 The exhibition runs until Sunday 24 May 2015 at Yarra Ranges Regional Museum, Lilydale. P.S This is not a paid or sponsored post. I was invited by the museum and visited out of interest. 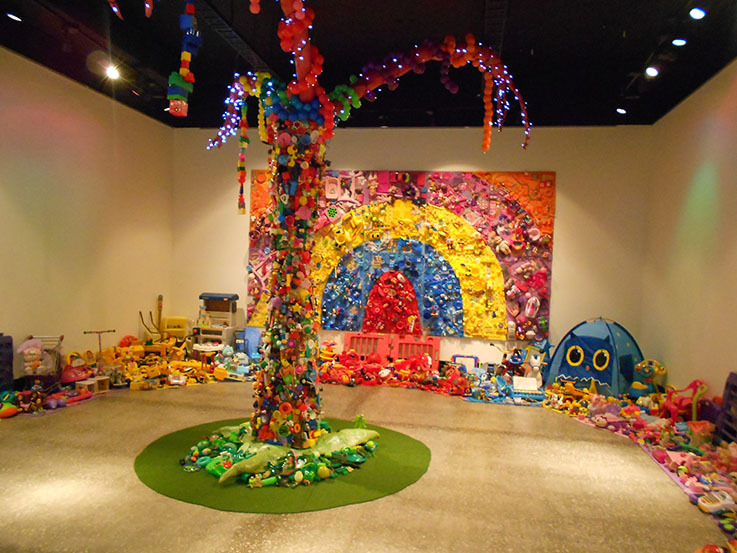 If you have a exhibition in the Melbourne area or even rural Victoria that focuses on trash or plastic let me know so I can share it on Facebook. Imagine if magazines featured these kind of headlines? Maybe not by April 2016...but a lady can dream. I go on about materials like plastic and its waste of resources. I also preach that voting with your wallet is just as important as going to a polling booth or rally. But what about my money that I put into my bank and superannuation fund – it is being wasteful too? Divestment. Divesting. These two words have been creating ripples over the last year and for good reason. And I am about to get in on the movement. There has been a rallying cry over the last four years from students at various universities around Australia and the world asking for their institutions to invest in companies that support a sustainable future and divest from those that harm. More recently I have heard the term divestment used to describe the process of moving your own personal money from a bank that invests in non-sustainable industries and invest in those that do. So I have decided to divest! Or to put it more plainly I am taking my money out of my bank and super fund, giving it to institutions that believe in for example renewable energy, among others, to be a kinder investment. Right now I am currently with one of Australia’s big banks and am in the process of switching. Same with my Super. My belief is that solar and wind power to be noble alternatives for much of our energy creation today. It does have its side effects on the planet throughout its life cycle, but right now it is not as harmful as the large scale fossil fuel consumption we have going on right now. By switching my funds to a bank and superannuation firm who believe investing in companies that not only see renewable energy but also ethical practices as the way forward, I will inevitably provide funds that will also see the continued development of recycled green-energy technology solutions too. For example if I was to move my superannuation to Australian Ethical they would take my money and in turn invest into companies like First Solar who believe in responsible product life cycle and making sure solar panels at the end of their life won’t be lost to landfill. This is an example of how divesting and reinvesting my funds will impact for hopefully the better. Recycling still has a looooong way to go, especially in the renewable energy sector. Solar and wind energy will only be a truly sustainable choice when it proves itself to be a circular process and not linear. Right now I am happy to let my new bank and super fund help solve these problems because as the renewable sector grows in demand and consumption then we need the environmental impacts addressed with solutions sooner rather than later. So how do I find out what and who my bank supports? People are divesting for reasons beyond fossil fuels. There are many financial institutions that don’t support fossil fuels, gambling, tobacco and poor labour standards to list a few. 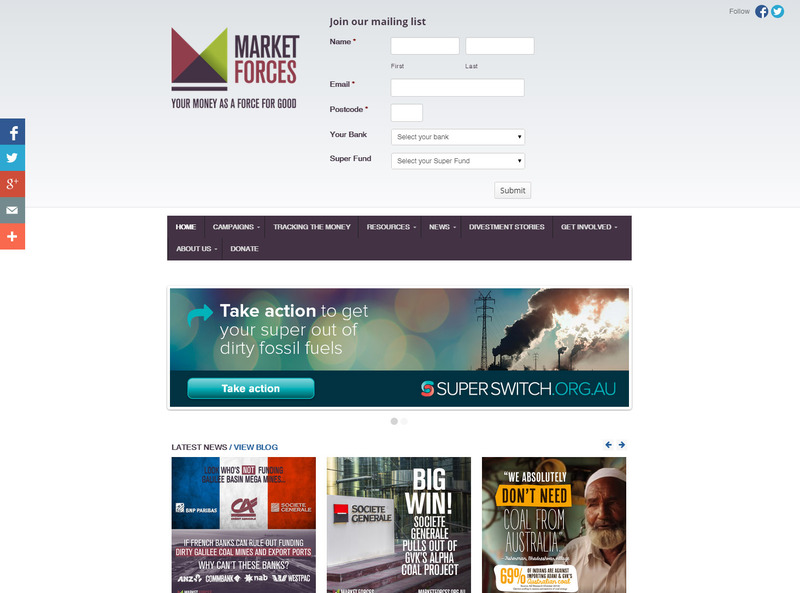 Marketforces.org.au allows Australians to suss out who banks support in terms of investments. It is simple and easy to use. There is even a function to send a note to the banks that do invest in fossil fuels to think differently. 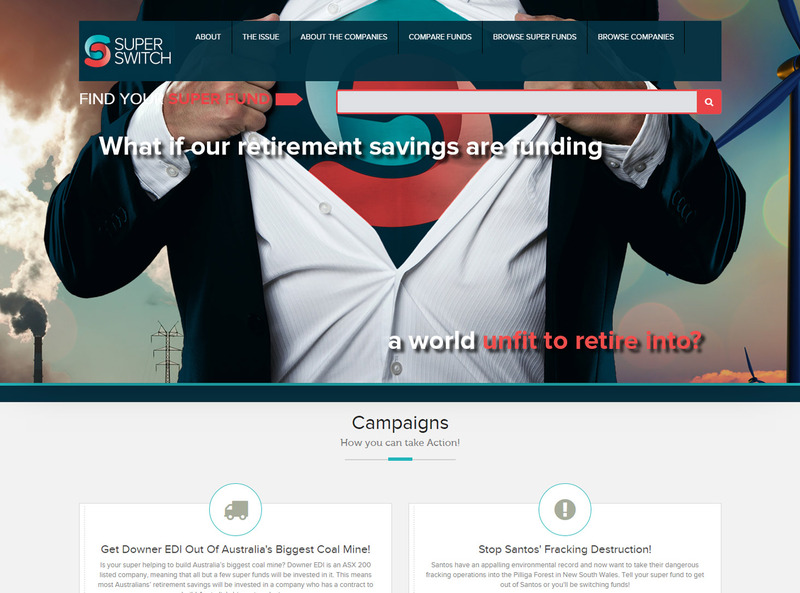 Superswitch.org.au is a great resource on Superannuation funds and their investments in Australia. Because this is an Australian based blog I am focusing on Australian banks. If you are from other countries and would like me to add a similar website to this blog post please leave me a comment below. I might be only one person with a tiny amount of funds, and my decision might seem pointless to others. It’s true I am not a big institution with millions and billions of dollars. My divestment will be a chore as I switch banks and super funds. My decision won’t whip the evening news into a frenzy. 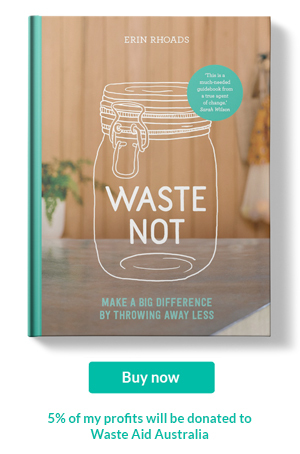 My day to day spending on groceries and other items is consciously made because I want my consumer choices to create no too little impact on the planet and other people… So why should I let someone else spend my money on things that I don’t agree with?! After all, my bank makes money off me as does my superannuation fund through investments from my money. It can be hard to go plastic free and be zero waste when buying perfume. But there is a way to limit what is added to landfill by making the choice to reuse. Plus this trick will also help you to avoid unknown chemicals and save on money. 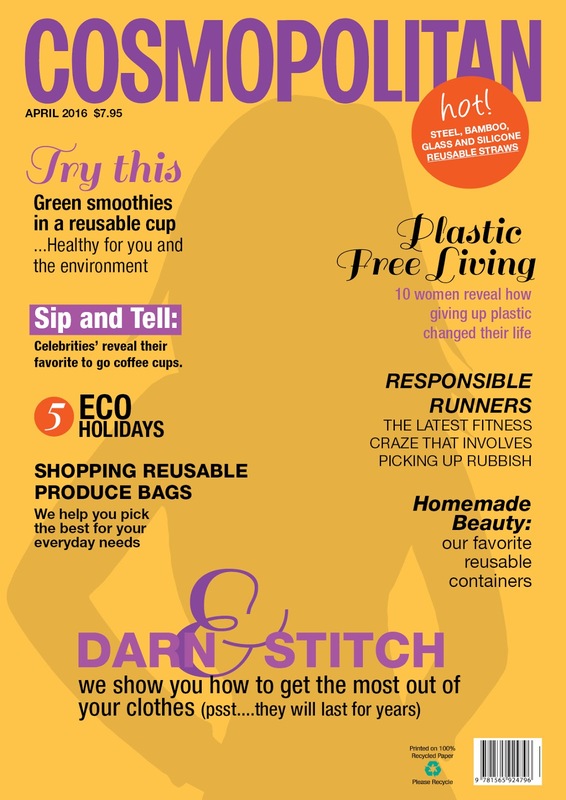 When I ditched the plastic, got educated on hormone disrupting chemicals in everyday items like perfume and decided to limit my trash much of my whole life changed. I had to let go of habits that brought me joy. One of those was my perfume. I loved my perfume. My first was 4711 that I would dab onto my wrists. Then in my teenage years I would shower myself in the heady fragrance of Impulse (cough cough). It was at the tender ago of 18 that I discovered my perfume, Yves Saint Laurent's perfume named Paris. And it was only until last year that I wore it religiously. I flirted with other fragrances over the years but I always returned to the sweet powdery smell of Paris's roses. But anyway, let's not dwell on the past. I have said my goodbyes and rather glad I have (even if I did miss it for a while). Today I am very happy to not be exposing myself to...well who knows what! The list of ingredients on perfume packaging is virtually non existent. Plus the bottles are a pain to recycle, there is the silly plastic nozzle and plastic tube. Oh, and its a bit expensive! My new perfume is oh so much easier. Last year I discovered Perfect Potion. 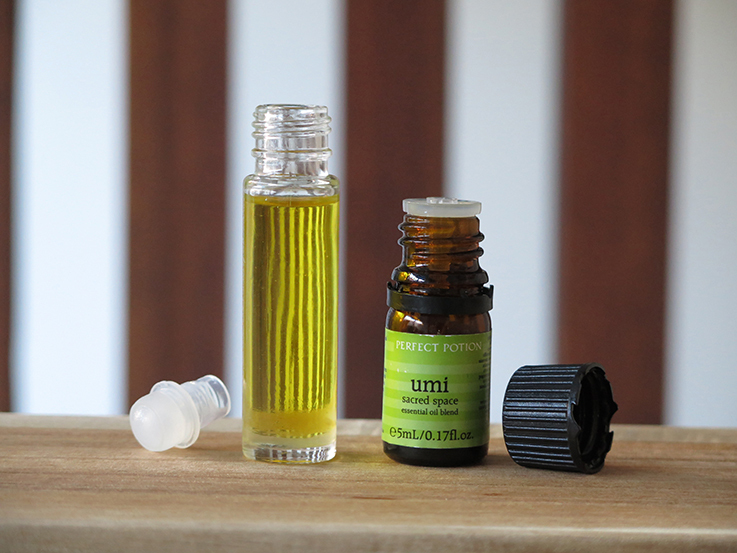 An Australian brand selling essential oils and oil blends. I was drawn to them because I could buy the bottles without a box and they were Aussie. After my first smell of their oils I became hooked. I use a range of them for our toothpaste, cleaning and...yep, you guessed it – my perfume. Each bottle costs around $20 and contains 100 drops. The bottles are made of glass but do feature a plastic lid and dropper. The plastic is recyclable as is the glass with a bit of a clean. The only problem is that when I used one as my perfume I went through the bottle in three months. Aside from the money being spent, it was also a waste of packaging. 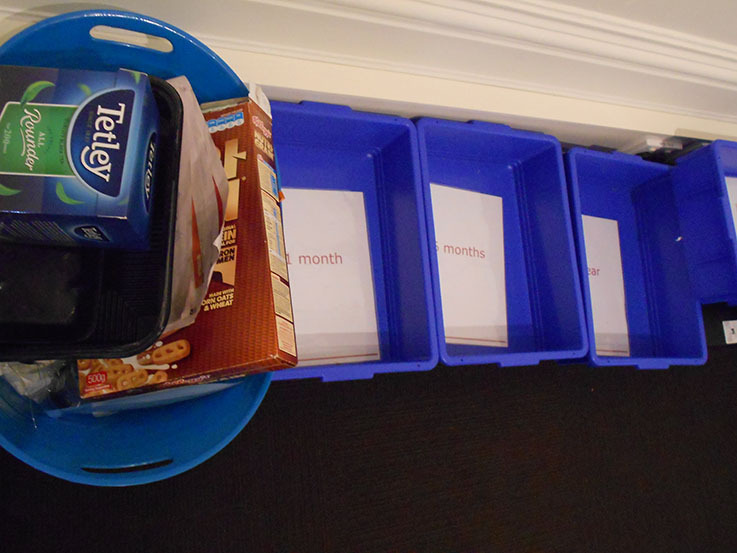 Recycling is great but reducing is smarter. I chose to buy one of their roll on perfume oil blends, deciding to use the perfume up and then fill the empty bottle with a carrier oil (almond or grape seed oil) that I can buy in bulk and add an essential oil too. This was a smart move as I am still using the same bottle of Umi I bought at Christmas time. As the oil becomes low I fill the bottle then add 10-15 drops of the essential oil, give it a shake and let it sit for a day before using. 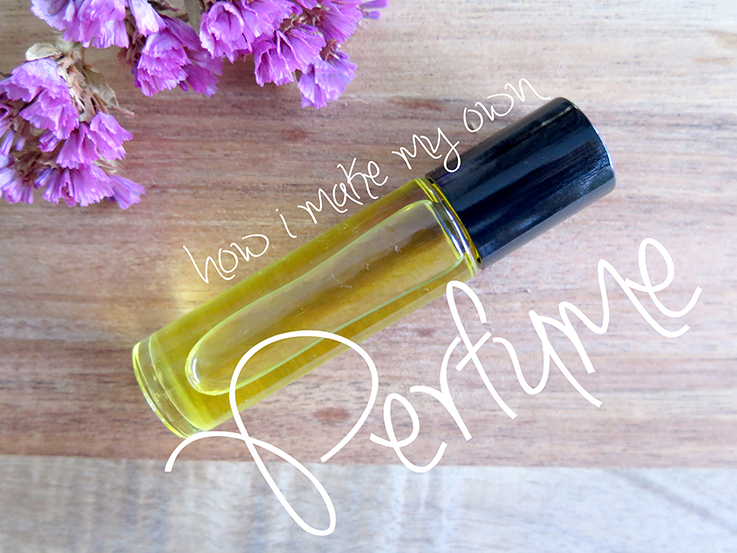 The fragrance from the essential oil blends with the carrier oil to create my very own perfume. Essential oils and medicine are the only two items I actively buy with plastic. I have not been able to find a alternate yet. For those wondering the roll on bottle is made of glass, the ball is glass but is held in there with a plastic stopper and the lid is metal. I'd prefer to not buy anything consisting of virgin plastic and really debated about it for a long time. 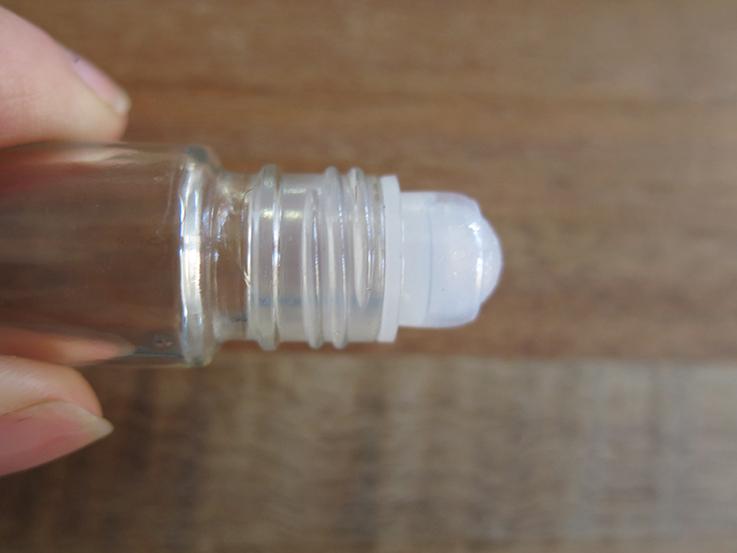 This method of reusing the roll on bottle reduces the frequency my essential oil bottles are going to the recycling depots. Recycling is taxing on resources also but if I look after this then I should have it forever. I was able to find a Plain Roll-On Glass Perfume Bottle on Amazon. Any essential oil would work for this too. Fellow zero waste blogger and cleaver lady Ariana of Paris to Go has also shared her zero waste perfume using vodka and rose petals. I would love to know what you use for a perfume? By the way, this is not a paid endorsement by Perfect Potion. I am just a fan of this brand.